Between November 2009 and January 2010, three completely new routes were climbed and equipped on the crag of the Montagna split in Gaeta. They are all located on the part of the wall that is under the fence of the belvedere that looks at the corner of the Southern Cross. At the same time the street "From Cape to twelve" has been completely re-equipped. The ease of access and the beauty of the rock they make an easy alternative to the most popular and classic streets located on the other side of the Grotta del Turco. The path, open from below, is the first track on the part of the wall to the right of the Turkish cave Looking at the sea; that is the wall facing the Beatrice sector. It starts from the grotto of the Turk using the first two pitches of the transverse Mare Nostrum. Then it goes up the wall using a system of ledges and comes to the attack of Cape to Twelve, intersects the via dei Desideri and reaches the top of the Falesia coming out exactly at the end of the fence that delimits the lookout. 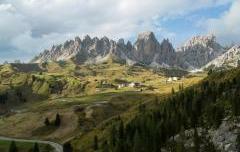 Extremely panoramic way, it allows the continuous view on the most frequented paths of the Falesia, with limited difficulties and on very inviting rock. It is advisable to use the first 5 shots of the road to go out then with the Way "From Cape to Twelve" which, with the request of Fabrizo Antonioli, in December 2009 offers a spectacular climbing on solid protections. You go down the stairs that lead to the Grotta del Turco and it attacks on the right side of the Grotto after passing some boulders.